An outstanding plant, widely grown as much for its attractive foliage as its brilliant flowers. 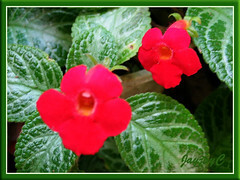 Excellent for hanging baskets or as ground cover. Two wonderful old hybrids, ‘Frosty’ and ‘Acajou’ (as pictured above) that are vigorous growers, so hardy and dependable! Both produce vibrant red (scarlet) flowers that are eye-catching and in beautiful contrast with their lovely variegated foliage that have scalloped leaf-margins. ‘Frosty’ has bright green leaves with silvery green midrib and veining, whilst ‘Acajou’ has dark greenish-brown or coppery-green leaves with the same silvery green markings but undersides, copper colored. Leaves are large, oval and puckered with a lovely metallic sheen. Very dramatic! Plant type: Herbaceous perennial, native to the Columbia, Venezuela and Brazil. 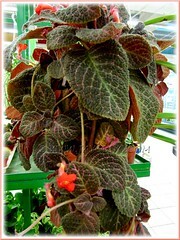 Features: Episcia cupreata is an extremely popular species of the genus Episcia, grown for its dazzling variegated foliage. It is a herbaceous evergreen perennial that is low-growing and has a stoloniferous habit with succulent and hairy stems. It reaches a height of about 22-30 cm and with a creeping growth habit, it can spread as far as 60 cm or more on ground. From the leaf axils, it produces a stolon or runner with a new plant sprouting at its tip and by reproducing repeatedly in this manner, rooting readily wherever it touches bare soil, it can easily cover a wide area. 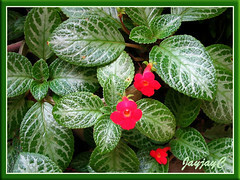 Hence, the plant became aptly known by one of its common name, Carpet Plant. Planted in a hanging basket or raised planters, the trailing stolons, heavy with a continuous supply of new plants at the nodes at various intervals, will hang downwards in a dramatic cascading form. Being widely cultivated, this species has resulted in numerous hybrids, cultivars and varieties, with an extensive range of dazzling leaf coloration, textures, patterns and sizes. Mostly, leaves are simple, opposite and oval-shaped or elliptic, ranging from 4-12 cm in length and have serrated margins. Leaf surface varies – some plants have a puckered or wrinkled surface and seemingly embossed, others are velvety, pubescent or smooth. Most diverse is the fabulous colorful variegation (2-3 colors) on the foliage, ranging from various shades of pink, white, green, red, copper and chocolaty-brown, with attractive veining or streaks in hues of silvery green, grey, pink, red and others. The leaf underside of some varieties is purplish or coppery and shows distinct midrib and veins. Another fascinating feature is its bright and colorful tubular-shaped flowers that beautifully stand out against the handsome foliage in delightful contrast. They are borne on long hairy peduncles arising from the leaf axils in groups of two to four, blooming continuously through the year in the tropics. The fused 5-lobed flower petals are about 2 cm across and may sometimes be slightly fringed. Most flowers are vibrant red with yellow throats, but the newer cultivars have them in pink, white, lavender, orange-red and yellow. It is known to fruit with a two-valved capsule, though infrequently formed in cultivation. No wonder we’ve never seen any so far! Culture (Care): Episcia cupreata is one of the easiest plant to grow, requiring minimal care for the hardy hybrids/cultivars but a little more attention for the less hardy ones. Just mimic the conditions of the tropical rainforest and they will be most happy. Light: Bright indirect light or filtered sunlight will be best. A few hours of morning sun is very ideal but avoid direct sunlight that can scorch its foliage. Can take low light to full shade but foliage color will be a tad dull and flowering much less or hardly any. Needs warmth, humidity and fresh air too to do well. Moisture: Require medium water regularly, letting soil to dry slightly between waterings. Soil: Best in any humus or organic-enriched potting mix that holds moisture, yet well-drained. Nonetheless, it can tolerate any kind of garden/potting soil that is free-draining. Others: Leaves will shrivel and turn brown from low humidity or too dry conditions. On the other hand, too much water or too little air circulation will cause dieback. Avoid drenching foliage when watering and protect them from heavy rainfall to prevent damage and rot. Feed every 2 weeks or once monthly with a balanced fertilizer for foliage plants at half strength. Pinch off withered or discolored leaves to maintain tidiness. Pinching off excess stolons as they emerge is one way of allowing the parent plant to grow larger and more luxuriant, as well as to encourage flowering. It is relatively trouble-free from serious disease and pests. Root rots, fungal leafspots, stem blights, aphids and mealybugs do appear though infrequently. Know more about the culture of Episcias at Green Culture Singapore. For temperate regions: Hardiness: USDA Zone 10-12. Water moderately in summer and sparingly in winter, just enough to keep the soil from drying out. Winter temperatures should be above 55 degrees F. Check information at Missouri Botanical Garden. Propagation: By seeds which are rarely available, leaf cuttings (a slower method) or tip cuttings (use a tip with at least 3 pairs of leaves and cut off the lowest pair before sticking into potting soil to root). Nevertheless, the quickest and easiest is stolon propagation which the plant does naturally, in that plantlets are produced at the tip of its stolons or runners trailing downward from a hanging basket or wherever they touch the medium. Thus, to propagate these plantlets, just detach them from their parent stems and pot them in fresh potting soil where they root and grow easily without fuss. 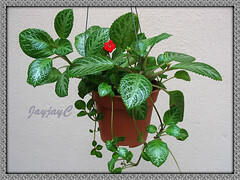 Usage: Episcia cupreata is great for container gardening, especially excellent for hanging baskets/pots, raised planters or elevated on a flower stand, displaying its cascading habit, be it indoors or outdoors. Ideal as an indoor plant in greenhouse or conservatory or as a houseplant in temperate regions, with some hybrids suited to be grown in bubble glass terrariums. 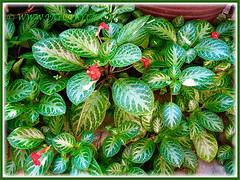 Outdoor in the warmer tropics, it is widely used as a ground cover, carpeting every nook and cranny in mixed beds and perennial borders, and softening its edges with its sprawling habit. ‘Alice Outback’ – leaves in dark purplish-pink with green edging; flowers are orange with yellow throat. ‘Black Star’ – dark copper-green leaves, lightly filigreed with purplish-pink veining. ‘Blue Nile’ – very dark green leaves with prominent light green midrib; flowers are lilac. ‘Cleopetra’ – leaves in pink and white with contrasting green midrib; flowers are brilliant orange-red. 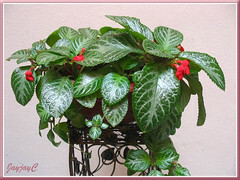 ‘Costa Rica’ – bright green leaves with red shading; flowers are brilliant orange-red. ‘Ember Lace’ – leaves with irregular blotches of pink, white and green; flowers are brilliant pink with frilled petals and yellow throat. ‘Flamingo’ – dark green leaves with light green veining; flowers are light pink with yellow throat. ‘Gold Digger’ – dark chocolaty-green leaves with purplish-pink veining at edges; flowers are brilliant red-orange with yellow throat. ‘Kee Wee’ – dark olive-green leaves with purplish-pink veining; flowers are bright orange with yellow throat. ‘Moonlight Valley’ – medium green leaves with flushes of yellow and salmon-pink markings at the margins. ‘Moss Agate’ – green leaves, filigreed with silver veining; flowers are brilliant red. ‘Pink Panther’ – leaves in bright silvery-green with dark green margins; flowers are brilliant pink with frilled lobes and yellow throat. 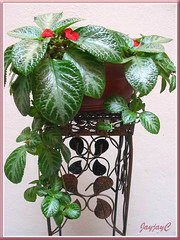 ‘Silver Skies’ – leaves, mostly in bright silver-green with medium-green margins; flowers are bright orange-red. ‘Sun Gold’ – dark green leaves with light green central veining; flowers are butter-yellow. 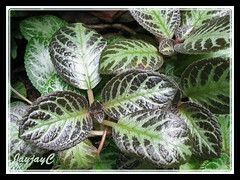 Do visit the Episcias photo gallery at The Gesneriad Reference Web to enjoy the images of these stunning beauties and many others. How is your flame violets doing now. I found that the newer varigated types are somehow more difficult to thrive compared to the common old ones. They’re okay, not as splendid as we would have wished though….meaning we’d love to see them trailing much longer over the sides of their containers, but so far have failed to get that effect. I am desperate! 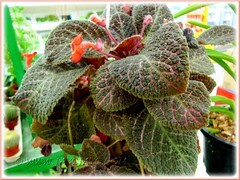 Where can I buy a flame violet (Episcia cupreata). I had one long ago and it was simply the most beautiful plant I ever had. I have not been able to find one since. Help, please. We’re unable to help, Joanne. Please google search for your nearest garden nurseries to purchase them.